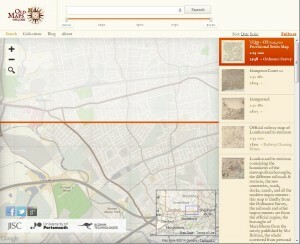 I was prompted by a tweet from Mia RidgeÂ to have another look at the oldmapsonline.org site. Anything that has maps and history and a slick interface is going to be something I like! But I was struck by the fact that I couldn’t sort the map results that appear in the right hand panel by date or by the scale of the map. Sometimes if you’re researching a location you just want detailed maps, or to look at the oldest ones first (they do have a very nice date range filter, but no sort options). So I’ve thrown together a very quick Greasemonkey script to help me, and I thought I’d share it. All it does is add two ‘sort’ links above the results panel. Click on either one and you’ll sort the records displayed in ascending order. Greasemonkey runs in either Firefox (with the Greasemonkey extension installed) or Chrome. In Chrome it’s easiest to install the Tampermonkey extension to avoid problems with loading external scripts (which you can read about here). Once that’s done, just click on this link -Â http://www.catchingtherain.com/scripts/oldmapsonline.user.jsÂ – to install it and then each time you loadÂ http://www.oldmapsonline.orgÂ it should automatically add the sort buttons. Just one caveat – the site has continuous loading of map items, meaning Â that as you scroll to the bottom it will download and display more items. The tool will only work with records that have been listed, so scroll down first if there are lots of maps for the area and date range you’re looking at. That said, if you sort and then retrieve more items, just click the sort button again.